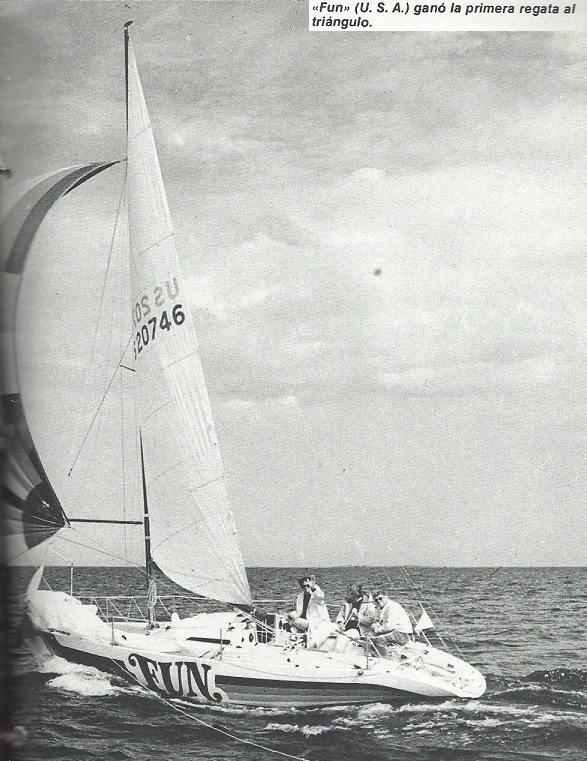 1975 plan DAVIDSON, cold moulded of oakume or meranti plywood over New Zealand pine with centerboard. Voiles Hood, vendu à Clay Bernard, un américain, aprés la QTC. QUARTER TON CUP, Helsinski: 1 - 13 - 9 - 13 - 1 = 5e/53. 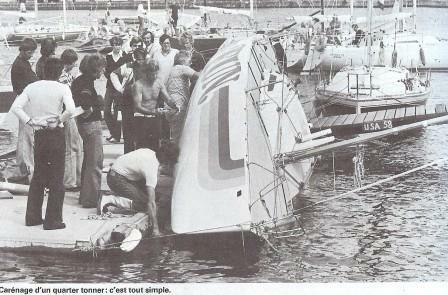 Trouvé dans un forum, Gary écrit: "Davidson's centreboarder Fun was also there, as a US entry (with Clay Bernard and Bob Chilton) as pre-race favourite, started well but fell away a bit in later races." 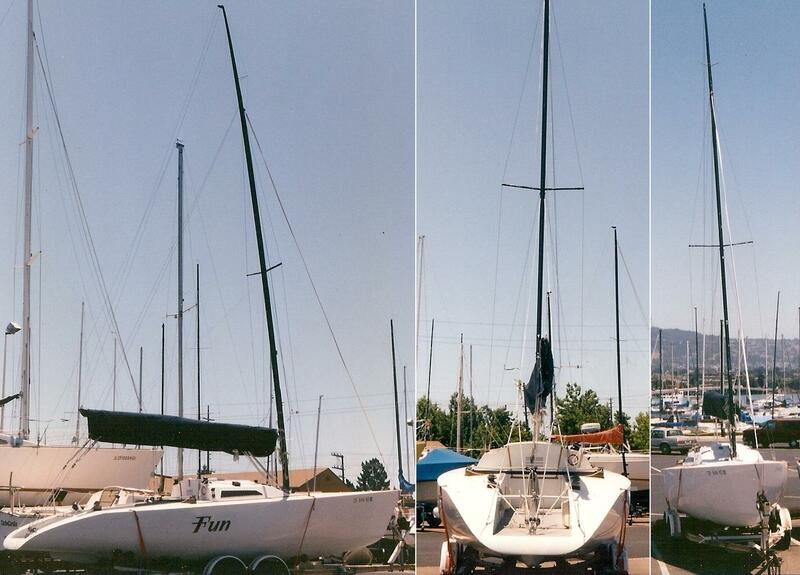 1997 San Francisco, acheté: "Original condition as purchased 1997"
"reshapping stern canoe body, original's 70's super graphics can be seen underr glass "FUN" in circus letters & three color nlue stripes"
2007 "The L.W.L. is 22' 6" the L. O.A. is 26' 6" , Displ. is 3, 400 lbs. Keel weight. is 1350 lbs. 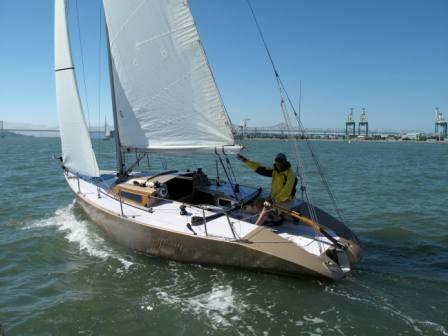 Max beam 8' 2" Sail area upwind approx. 350 sq. ft. Spinnaker, 500 sq. ft. Draft is 5' 6", Mast height 31' 6". boom length,11' 8". The boat originally had bricks of lead in the bilge and a centerboard, with a keel stepped alum. mast. In its present configuration it has a carbon fiber I.M.S. type retractable keel, with a carbon removable rudder and a deck stepped carbon mast. There has been a small 12 hp. saildrive installed with a folding prop"
2016 Mai, from Dutch QT Class Facebook: Got in contact with John Bonica (long live www.boatdesign.net!) 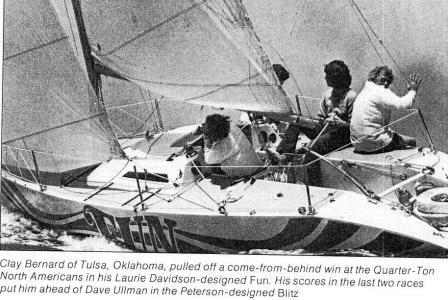 who sailed 'FUN' (Laurie Davidson centerboarder, KZ-3003) at the 1976 Quarter Ton Cup in Corpus Christi and 'Selfwhiting' (Paul Whiting centerboarder, KZ-3524) at the 1978 Quarter Ton Cup in Japan. He send us the following mail. "Hi Hylke, Good to hear from you. I will try to answer your questions about 'FUN'. How we built the boat and our experience with the first center boarder. In 1978 I took another center boarder to Japan for the worlds. Another adventure for a radical design. 'FUN' was not complete when we took it to the 76 series. 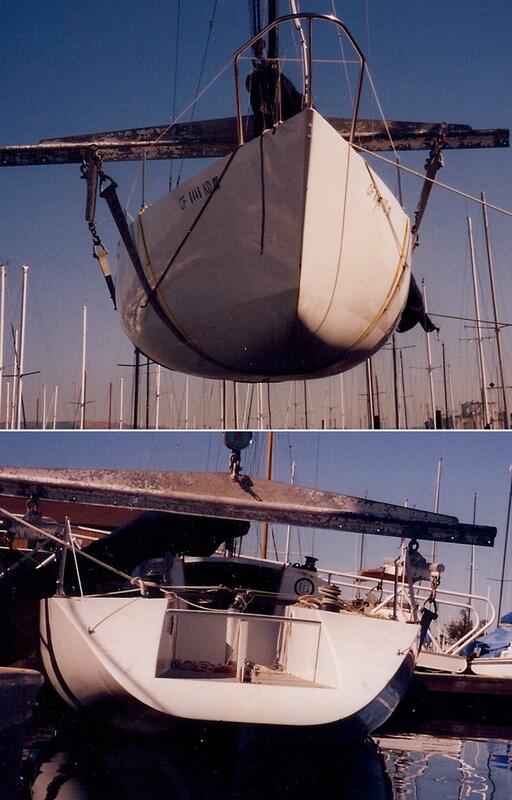 I helped build the boat spending many hours under her with a sanding board. We had to install compass and depth meter and finish the rig when we got to America. Davidson's wife was American and the boat was shipped to Seattle and Davidson trailed the boat behind his Cadillac car on a trailer built in Seattle. A trip of 1,500 miles. 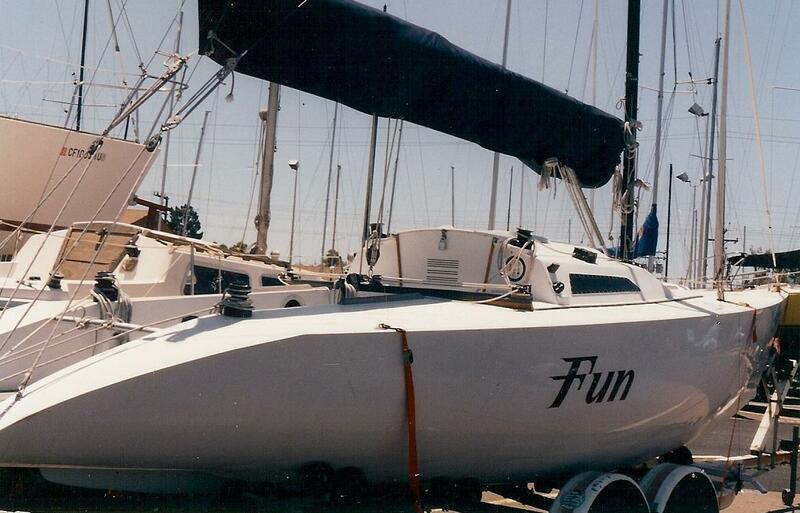 We had only sailed 'FUN' one time in New Zealand as a trial between 'Magic Bus'. The boats appeared to have similar speed downwind. Davidson's idea of the center board I believe was to make a fast light boat, with internal ballast. No weight in the board. It was tough to get the board down as it was so light. We found that raising the board downwind did not work as the boat made a lot of leeway with it up. We were one of two boats with fractional rig, 'Magic Bus' was the other fractional. Big main, bendy rig and small headsails were faster reaching and downwind. 'FUN' was unfinished inside. She was built of a very light cold molded New Zealand native ply called Kauri (three layers). The boat was lively and needed dinghy sailors to manage her. 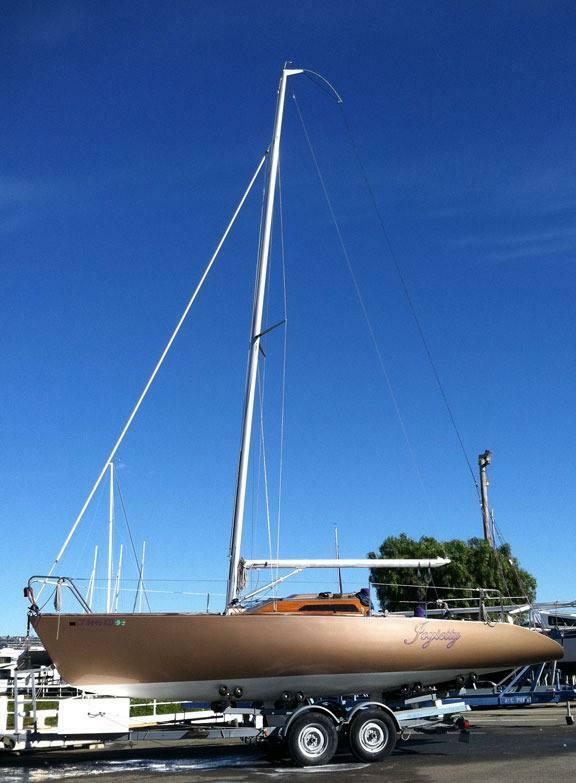 Davidson opted out of racing on her due to the power and huge sail plan. The mainsheet and traveller were key for control. We finished 5th. 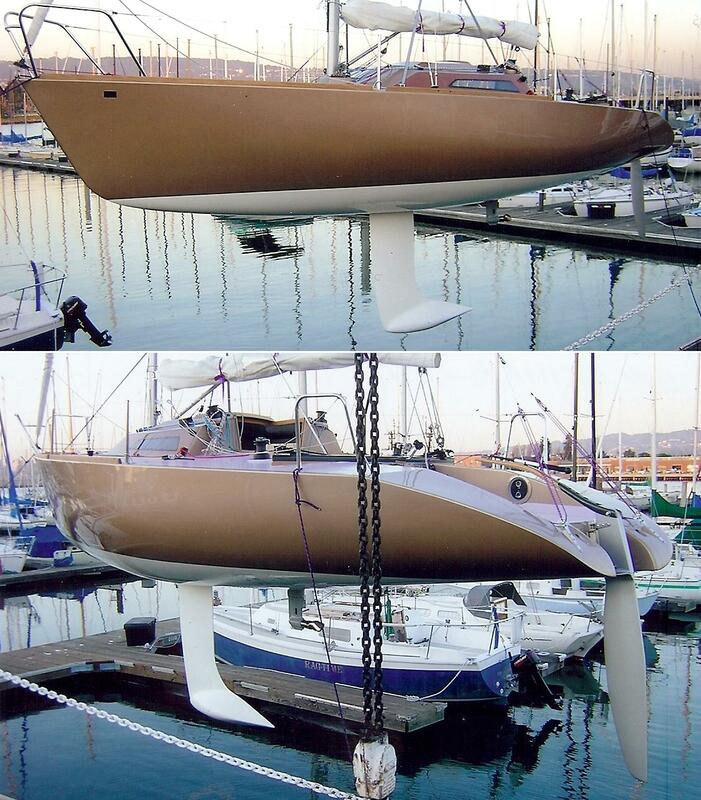 Observers considered that 'FUN' was the fastest yacht overall, especially on broad reaching legs "
2018 April, Patrick Kohlman is placing his gorgeous boat 'FUN' for sale. 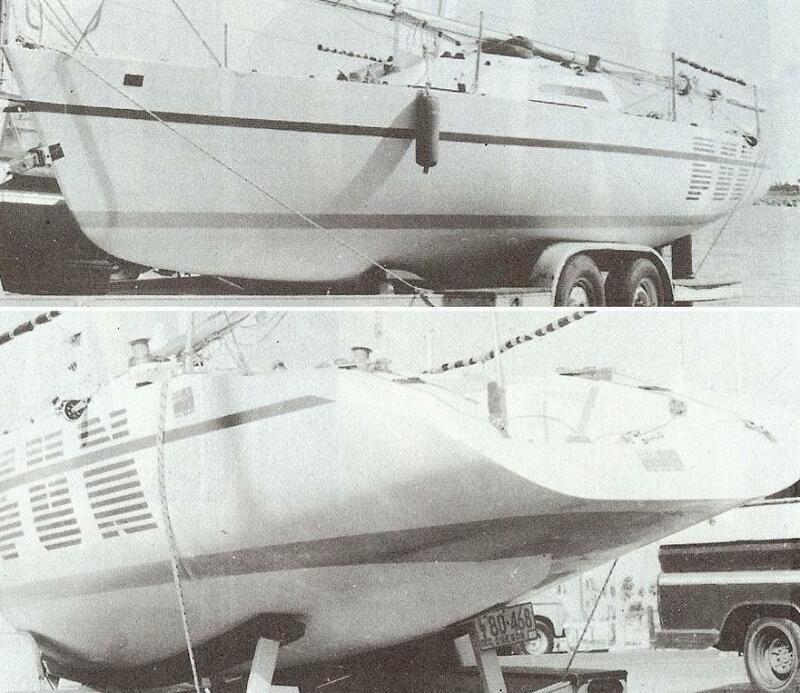 27-FT Laurie Davidson Quarter Ton, 1975 $28,000 -Complete rebuild. Carbon mast, keel, rudder. 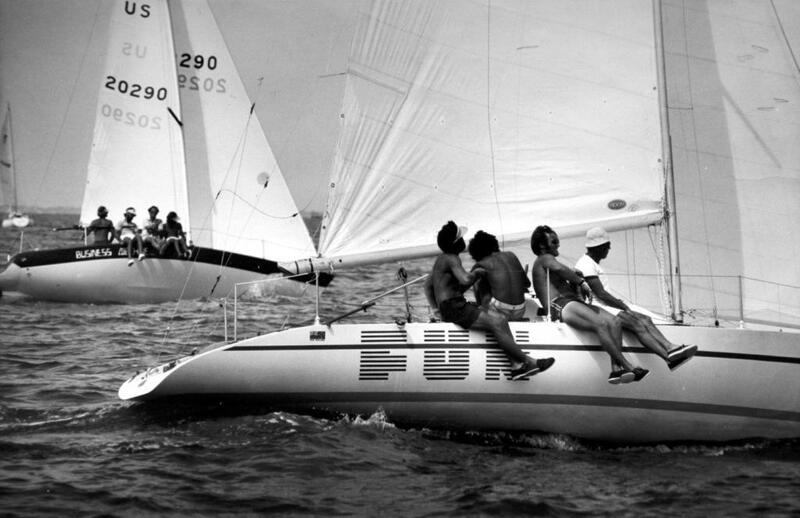 Honda sail drive. Two suites sails, racing and cruising. Dry sailed on road trailer. Boat cover. Survey 2016. - I always say that in Patrick's boat you can eat off the floor because is so clean, and that in Pantera you can eat off the floor because of all the food stuck to it!